Medal grouping awarded to Squadron Leader Vernon Ralph Garcia 'Harkie' Harcourt (41790), a Mosquito pilot with 139 (Jamaica) squadron, killed in action on Friday 21st May 1943. He was piloting a Mk.IV Mosquito, DZ464 XD-C, on a raid from his base at RAF Marham, Norfolk, to Orleans in France. The aircraft was shot down by flak on the coast near Le Treport, Normandy, when returning from the raid. Both he and his Navigator, W/O Jocelyn Friendly DFM (581211) were killed. Harcourt was just 25 years old. He is buried in plot H.17 of the Dieppe Canadian War Cemetary, Hautot-Sur-Mer in France. 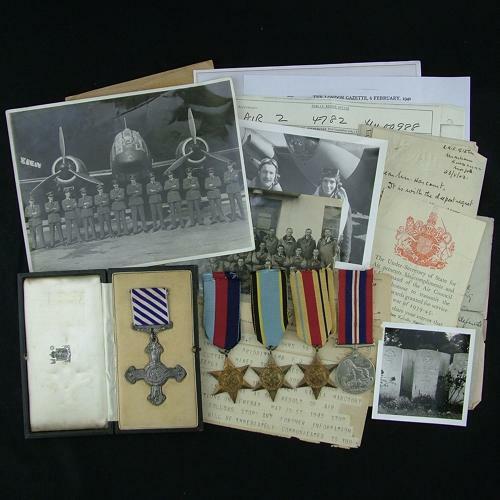 The grouping includes the Distinguished Flying Cross (unnamed as issued, 1942 dated, with original Royal Mint case), 1939-45 star, Aircrew Europe star, Africa star and War medal. These are complete with loose ribbons. Also comes with condolence forwarding slip for the medals (name mispelt which is not uncommon). Accompanied by the original and poignant 'Missing in Action' telegram dated 22 May 1943 and a handwritten letter to his parents from the Commanding Officer. He writes in the letter 'It is with the deepest regret that I have to confirm my telegram dated 22/5, informing you that your son is missing. He was seen to crash having apparently been hit by flak. I very much regret to say there can be little hope that either he or his navigator, W/O Friendly, could have survived...' Also comes with two original group photographs that show Harcourt in uniform and flying kit. A reprint photograph shows Harcourt & Friendly in front of their Mosquito. This is a great shot with excellent flying kit shown. Finally there are some copied documents including a page from the London Gazette, a small black and white photograph of his grave and his recommendation for the DFC c. 26.2.42. This details his flying from the first operations on 18.5.40 : Squadron Leader Harcourt was flying Bristol Blenheims with 108 Squadron during the evacuation of France and Germany. On one occasion he was detailed to take food to the BEF at an aerodrome in Belgium that was practically surrounded by the enemy. The mission was carried out successfully. At the end of November 1940 he had converted to Wellington bombers and posted to the Middle East where, as second pilot, he had to take control of the aircraft when the pilot was taken sick, landing the aircraft safely. He undertook 44 raids by the time of his recommendation for the award of the Distinguished Flying Cross and the citation reads 'at all times his keeness for operations and the determined manner in which he has carried out all his operational crews of this squadron'. A very interesting grouping. Stock code P22510.